Located in the centre of Ios Town, Vesuvio Chora is traditionally built in Cycladic style. It offers self-catered accommodation with air conditioning. Free Wi-Fi is available throughout. Free shuttle services from and to the port are provided. 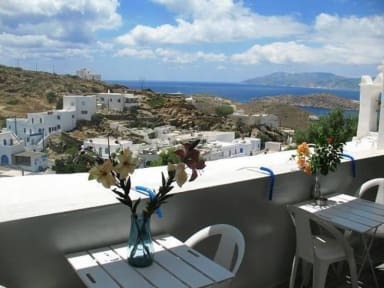 Featuring views to the Aegean Sea, all bright studios and apartments at Vesuvio open to a private balcony. Each has a kitchenette with a mini fridge and cooking hobs. A TV and free toiletries are included. Several restaurants and café bars are accessible within short walking distance. The beach of Mylopotas and the port of Ios are 2km away. Free public parking is possible at a location nearby. Reception open 09:00 - 21:00. Free shuttle services from and to the port are provided.